By legend the birthplace of the ancient Greek goddess of love Aphrodite, Cyprus's modern history has, in contrast, been dominated by enmity between its Greek and Turkish inhabitants. In 1974 the island was effectively partitioned with the northern third inhabited by Turkish Cypriots and the southern two-thirds by Greek Cypriots. A "Green Line" - dividing the two parts from Morphou through Nicosia to Famagusta - is patrolled by United Nations troops. The UN drew up the Green Line as a ceasefire demarcation line in 1963 after intervening to end communal tension. It became impassable after the Turkish invasion of 1974, except for designated crossing points. In 1983 the Turkish-held area declared itself the Turkish Republic of Northern Cyprus. The status of Northern Cyprus as a separate entity is recognised only by Turkey, which keeps around 30,000 troops in the north of the island. The prospect of EU enlargement concentrated minds in the search for a settlement. UN-sponsored negotiations continued throughout 2002 and a peace plan was tabled. Soon afterwards the EU invited Cyprus to become a member. But hopes that the island could join united were dashed when leaders of the Turkish and Greek communities failed to agree to the UN plan by the March 2003 deadline. In the months that followed travel restrictions were eased, enabling people to cross the border for the first time in nearly 30 years, raising hopes that progress might be on the way. As EU entry approached, a revised UN reunification plan was put to both communities in twin referendums in April 2004. The plan was endorsed by Turkish Cypriots - though not by their then leader Rauf Denktash - but overwhelmingly rejected by Greek Cypriots. Because both sides had to approve the proposals, the island remained divided as it joined the EU in May. EU laws and benefits apply only to the Greek Cypriot community. More than two years later, hopes of progress were rekindled at UN-sponsored talks between Cypriot President Tassos Papadopolous and Turkish Cypriot leader Mehmet Ali Talat. The two agreed on a series of confidence-building measures and contacts between the communities. Hopes were given further impetus by the election of Demetris Christophas as president in February 2008. He immediately began talks with Mehmet Ali Talat on reuniting the country as a bizonal federal state. However, the initial optimism faded as talks made only slow progress through 2008, and hopes for a deal were dealt a blow by the victory of right-wing nationalists at parliamentary elections in northern Cyprus in April 2009. Talks stalled through 2009, and the nationalists consolidated their dominance of northern Cyprus by winning the presidential election there in April 2010. Turkey has a particular interest in seeing the situation resolved as its own EU aspirations are linked to the island's future. Communist Party leader Demetris Christofias won the presidential election of February 2008 by a big margin. 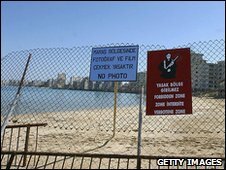 Ending the 34-year-old division of the island was the main campaign theme of Mr Christofias, a builder's son from a village now in Turkish-held Northern Cyprus. His election gave new impetus to talks aimed at reunifying the island as part of the EU, but hoped-for early progress turned out to be elusive. Mr Christofias was educated in the Soviet Union and is a fluent Russian-speaker. He joined the communist-rooted AKEL party at the age of 14 and rose through its ranks to become leader in 1988. He has a penchant for wearing Che Guevara T-shirts. 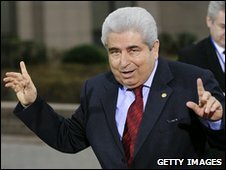 Mr Christofias was elected president of the Cypriot House of Representatives in 2001 and won re-election in 2006. The the main right wing opposition party DISY won the May 2011 parliamentary elections by the narrowest of margins. With AKEL president Dimitris Christofias at the helm, the DISY party's slim majority did not have initial impact as the smaller centre-right DIKO party continued in coalition with AKEL. DIKO quit the government in August 2011, leaving President Christofias increasingly exposed in parliament. 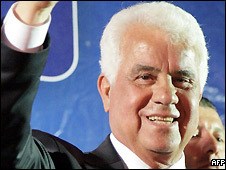 Mr Eroglu beat the pro-unity incumbent Mehmet Ali Talat in the April 2010 presidential election in the self-proclaimed Turkish Republic of Northern Cyprus. He was the candidate of the nationalist, pro-independence National Unity Party, which he has led with a two-year break since 1983. He took over the party and premiership from veteran Turkish Cypriot leader Rauf Denktash when the latter was elected president of the north, and served three terms as prime minister until winning the presidency. His victory in the parliamentary elections in April 2009 marked the return of the previously-dominant nationalists in the north after their eclipse in the 2003 parliamentary and 2005 presidential elections. The failure of Greek Cypriots to support the 2004 UN-backed Annan Plan for reunification began the gradual disillusion of Turkish Cypriot voters with their pro-unity authorities. Born in Famagusta in southeastern Cyprus in 1938, Mr Eroglu studied medicine in Turkey. The Cypriot media mirror the island's political division, with the Turkish-controlled zone in the north operating its own press and broadcasters. State-run radio and TV compete with private operators, and relays of Greek and Turkish stations are on air across the island. Nicosia officials say the switch from analogue to digital TV broadcasting will be made in 2011. Obstacles to the free flow of news across across the divide weigh heavily on journalists, Reporters Without Borders said in its last account of media freedom on the island (2006). There were more than 482,000 internet users by June 2011 (Internetworldstats). Is time running out for Cyprus?